If you have an unaltered female dog, chances are you will end up with a litter of puppies at some point. But whether you planned for puppies or not, there are "warning" signs on NolongerWild.com that your pooch is going to be a mommy. According to veterinarian, you may not know your female is expecting until she is about three weeks into it. The following are some warning signs of pregnancy in dogs, but these can differ from canine-to-canine in both the start of the symptom and the duration it lasts. Appetite changes are one of the first signs of pregnancy in dogs. This is kind of like "morning sickness" for women except the dog doesn't usually vomit because of it. Many dogs will go off of their food during this time. Don't try to force your female to eat, as she will most likely resume her regular meals within two or three days. However, if she goes longer without eating any food, be sure to call your veterinarian. On the other paw, some females will get an increase in appetite almost as soon as she becomes pregnant. If she is gobbling down her kibble then looking for more, try to space her feeding out during the day with an increase in how much you serve her. Some canine formulas will carry a food just for pregnant females. You may also want to put her back on puppy food, which has an increase in protein and other nutrients she will need for growing puppies. A spayed female dog that has never been pregnant will have very tiny, almost flat nibbles. The teats of an expecting female will, however, show remarkable changes. Around two weeks into your dog's pregnancy the nibbles will change color from a light pink or gray, to a darker shade of pink. This is due to the increase in blood flow. Her teats will also grow in size due to the development of breast material and for the production of milk. Four weeks after your dog was impregnated, you may notice more vaginal discharge. However, if there is a significant amount of blood in the early or middle stages of her pregnancy, be sure to take her to the veterinarian. The energy levels of pregnant females will vary from dog to dog. Some can exhibit normal energy levels until they become too far along. Others may have a decrease in activity levels from the very beginning. This is due to both the extra strain of carrying a litter of growing puppies, as well as some dogs do suffer from depression during pregnancy. Of course an enlarged abdomen is a clear indication that your dog is pregnant. Your dog will gradually gain weight as the weeks pass, By 40 days along, your pooch may have gained anywhere from 20% to 50% more body weight than she originally had. Unlike a home pregnancy test for humans, the DIY doggy pregnancy test isn't as simple as peeing on a stick. Most of these tests require the pet parent to get a blood sample from the dog. Once this is obtained it must be taken to a veterinarian to be spun in a centrifuge (unless you just happen to have one of these at home). Once you have the plasma you can get the results from the test at home. This may be difficult for most people, but your vet can help you tell if your dog is pregnant. When you take your dog to the veterinarian, he or she will be looking for avery specific hormone in her blood called, Relaxin. When a dog is pregnant this hormone is produced in large quantities around the 21 to 25 day-mark and is a tell-tale sign that your pooch is preggies. Another method your vet may use is physically palpating your canine's abdomen. A trained professional can feel the puppies in the womb. 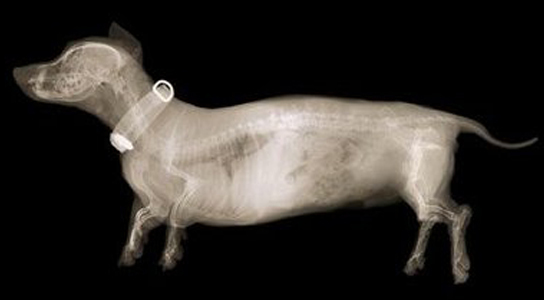 X-rays can also be taken of your female dog, but this isn't usually done in normal pregnancies, as it can be expensive. An ultrasound can also be performed on your dog around 4 weeks and is just as it would be on a human being. Now that you know your dog is pregnant there are some things you will want to do to help her along. Most females have a gestation period of 55 to 72 days, so this time is crucial to the proper development of her pups. As we touched on earlier, a pregnant female needs a high quality food that provides her with the proper nutrition for gestation. Cheap foods are filled with fillers and aren't going to do the trick when mom is feeding many extra growing bodies. It is recommended you look for a brand that has passed the American Association of Feed Control Officials (AAFCO). The side of the bag on an approved food will read; “Animal feeding tests using AAFCO procedures substantiate that XY Food provides complete and balanced nutrition for YY Dogs." In addition, if you are not feeding your female a food made specifically for pregnant dogs, you should switch to a good quality puppy food during the 5th and 6th week of pregnancy. Your female's body will be demanding more nutrition (which can be found in puppy food) for her growing litter. You will also want to increase the amount of food given by 20% to 25%. In your dog's last 8th and 9th week of pregnancy you should increase her food intake by another 25% as the pups will be almost full-term. If your dog has been taking any medications, including those for flea control or deworming, talk to your veterinarian to make sure they are safe for pregnant dogs. Some of these prescribed or over-the-counter medications, treatments or supplements (especially calcium) can harm the unborn puppies. The further along your dog goes in her pregnancy the harder it is going to be to exercise. Never push your female to do more than she can. Gentle daily walks is a good way to keep her moving, but again for short periods-of-time. During the last 3 weeks of your dog's pregnancy and 3 weeks after she has given birth, keep her away from other dogs. Your female will feel very vulnerable and, perhaps, even aggressive to other animals, so give her a private spot to relax and give birth. A whelping box is a contained (open air) place where your female can give birth and take care of her puppies. The size of the whelping box will depend on the size of the mother dog. These can be purchased or made to fit your canine. Once the puppies are born, the mother dog usually takes care of them, but you will still need to keep an eye on her and the puppies. Knowing when your female dog is pregnant is vital to her health and the well being of the puppies. Do the tests, then get ready to provide mommy-dog with all she needs to have a safe and healthy pregnancy and puppies.